If you haven’t heard, White Labs is being sued for (possible) contamination of their yeasts with Saccharomyces cerevesia variant diastaticus. Diastaticus is unusual, compared to other brewers yeast, in that it expresses an enzyme which allows for it to eat long-chain carbohydrates. This includes the dextrins which are normally left behind in beer – e.g. the things that provide body and some residual sweetness. In the case of this lawsuit, the brewer claims several yeasts sold by White Labs was contaminated with diastaticus, leading to over-attenuation, off-flavours, and bottle bombs in beers that had gone to market. To my surprise, one piece of (rumoured) information that came out of this was that White Labs lacks PCR for testing samples for contamination. Given that I’ve managed to use these methods within the confines of my home brewery (granted, with the advantage of having access to a “real lab”), I was shocked to learn that one of the worlds larger yeast production companies lacks this relatively inexpensive form of quality control. Even more shocking was when I learned that companies sold detection kits that cost ~$30/test; far above the $3 to $5 an in-house PCR assay should cost. But in retrospect, this isn’t all that surprising…white labs has a history of yeast “contamination” of their Lactobacillus cultures, mis-identified a Sacch as a Brett, and have a mixed culture in place of a pure culture in their version of Brett Drai…the difference this time being that these on-going contamination/identification issues may have cost a brewer a lot of money. This is the first of a short series I am writing, which will cover the use of PCR to detect yeast, bacteria and S. cerevesia var. diastaticus in fermenting beer. This series is largely aimed at medium-sized craft breweries, as the initial investment into equipment is out of the range of most home brewers and probably not the best place for a small brewery to invest. However, regardless of the kind of brewer you are, or the scale you operate at, I hope you find the series interesting and informative. Diastaticus is a variant of conventional brewers yeast S. cerevesia. What makes it different is that is expresses an enzyme (glucoamylase) which allows for the yeast to break down long-chain carbohydrates such as starch and dextrins into glucose; the glucose can then be fermented, leading to super-attenuation. In addition, these yeasts tend to be POF+, meaning they will impart clove, pepper or other phenolic (off-)flavours into the beer. What makes this yeast particularly insidious is that it is also used commercially – many saison yeasts are diastaticus strains, which is why they super-attenuate. Wyeast 3711 is one example of a diastaticus strain. So its not too surprising that a yeast-production lab could end up with diastaticus infections, simply though incomplete cleaning/sanitation of equipment between production runs. What Makes for a Good Test to Detect Contamination? Contamination detection methods are only useful if they are reliable, specific (e.g. do not mis-identify the contaminant) and sensitive (e.g. can identify trace contamination). In addition, you usually want internal controls – at a minimum, some form of positive control that tells you the procedure actually worked. The American Society of Brewing Chemists specialises in developing procedures to aid in various aspects of brewing – including detecting contamination. They have published a method for identifying diastaticus, although after reading it I am not overly impressed – the method is sound, but the implementation lacks a positive control, involves an unnecessarily complex and expensive set of equipment, takes more than a day, and utilises kits that are pricey and overkill for the process being conducted. The method I am presenting over the next few posts is based on a simpler – yet more reliable – technique to isolate the DNA of unknown organisms, and then uses the same PCR method as the ASBC method to identify diastaticus (as well as bacteria) in the sample. This method is the standard in environmental microbiology, and can be used to isolate DNA (and perform PCR) off of nearly any bacteria, archean, fungi, plant, animal, or other phylogenetic group you can name. This is paired with PCR detection of fungi (the positive control), diastaticus, and bacteria, thus detecting all groups of potential beer contaminants. This method is robust and simple to implement – indeed, I use a variant of it in my undergraduate teaching lab, where it is employed in the third lab of the course. In other words, its well within the capabilities of anyone who can plate yeast. A robust method of isolating DNA is used to purify DNA from the yeast and contaminants in the sample. In this case we are using the instagene matrix from biorad, which cheaply and simply isolates DNA from pretty much any biological sample. This matrix also has the advantage that it removes compounds from the sample that may interfere with downstream steps. 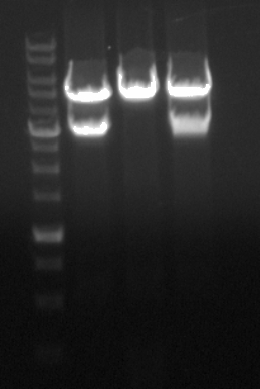 DNA gel electrophoresis to visualise the DNA products produced by PCR. In terms of costs (details in the next post), this will require a few thousand dollars of investment into equipment (although DIY and purchasing second-hand kit could reduce this to below $1K), and reagent costs at ~$3 per test. DNA Isolation: Instagene is a solution of microbeads; by heating cells suspended in instagene, combined with physical shearing, the cells are ruptured. The beads absorb many biological materials that can interfere with PCR, leaving behind a pure enough solution of DNA for subsequent analysis by PCR. PCR: PCR works by selectively copying a user-specified region of DNA (see image to right). This copying process works by binding short pieces of DNA (called primers) to the genomic DNA; the primers are positioned on either side of the region you want to copy. A DNA polymerase (DNA copying enzyme) then copies the DNA between the two primers, making a copy of that specific region. Every time you repeat this cycle you double the number of copies of the DNA region of interest – meaning after 40 or so cycles (~2 hours of PCR) a single contaminating diastaticus cell in the sample can result in 549,755,813,888 copies of the DNA region that identifies this type of yeast – an amount more than easy to detect using simple DNA detection techniques. Non-diastaticus yeasts will not produce this band. Similar bands will be produced for the positive control and bacteria tests. For a full description of how PCR works, see this article on wikipedia. Contamination Detection: This is performed using gel electrophoresis. In simple terms, the DNA is placed into an agarose gel, which contains small (molecule-sized) pores. The gel is then immersed in a a tank containing electrodes at either end and which is filled with a conductive buffer. An electric charge (usually 80-120V) is applied to the gel via the electrodes. Because DNA is negatively charged the DNA will be pushed through the gel by the electric field, running away from the negative electrode and towards the positive electrode. The DNA has to make its way through the pores in the agar, with smaller pieces of DNA moving faster as they can “squeeze” through the gel more easily, thus separating the DNA by size. Usually a DNA ladder – a solution containing DNA of known sizes – in run beside the PCR products so that the size of the DNA bands can be determined (see image to the right). The DNA gel contains a DNA stain which allows the DNA to be visualised under UV light. In the case of this detection method, the positive control will produce a band of 800-850 bp in size (for Saccharomyces), although other yeasts can give different sizes (350-900 bp). The diastaticus test will produce a band of 868 bp, and the bacterial test will produce a band of ~1500 bp. That’s it for this post. The next post – hopefully coming later this week – will cover the equipment and reagents required, and will give an estimate on the cost of the test. The third post – likely in a months time – will give a detailed description of the methodology, and show a few trial runs under varying conditions to illustrate the sensitivity and specificity of the test. First and foremost, thanks for such an informative blog and post. As a homebrewer, I have benefited a great deal from your insight and knowledge (not to mention getting into the extended hobby of yeast wrangling). I’ve been doing a fair amount of reading on Diasticus and I wonder if there isn’t a simple first-step test that we could do as homebrewers, namely using starch agar as a differential medium and then conducting an iodine test to validate if the colonies have indeed produced the enzymes necessary to metabolize starch. What do you think? I realize that this wouldn’t be a positive indication for Diasticus per se, but would it not at a minimum provide confirmation that some form of wild yeast has made it in? It would seem to me that this test, coupled with a differential medium like LCSM might at a minimum give direction to a home brewer. Just a thought from someone who now wishes he paid a lot more attention to high school biology but admits he knows very little. In theory it can work. Starch-agar plates are cloudy (due to the starch), and a diastaticus colony will turn the plate transparant, so you may not even need to add iodine (although it does help). Cost-wise, its probably not something a homebrewer would want to do regularly; you need a lot of iodine for the test (a few bucks worth), and you need to purchase peptone and lab-grade yeast extract (fairly expensive reagents) to provide the nutrition the yeasts need. Mix the ingredients, boil for 5 min to hydrate the starch, and then pressure cook to sterilise and pour the plates. You will need to grow the yeast on the plates for a long time (5-7 days, maybe more) before adding the iodine, as the diastatic reaction can be a little slow. Flood the surface with iodine, and then pour it immediately off the plate (collect it for reuse). Diastatic strains should have clear (non-black) areas surrounding the colony. Thanks Bryan for a very comprehensive answer. I agree that it isn’t a simple solution, but in the context of confirming a diasticus colony, or else a wild yeast strain that has contaminated a sacch strain, it seems like it would be worth the time and investment. Are the yeast extract and peptone absolutely necessary? Would it not be possible to simply use a more traditional wort-agar medium to which starch was hydrated? Either way, you give some great direction here into avenues to explore further in the context of a homebrew setting. Much appreciate it. I’ll give it a try and see what I discover. Hi Bryan, good to see you posting again! I’m looking forward to this series. I know you are short on time but it’d be awesome if this ended up in the ASBC/EBC/IBD journals! Just a heads up, the “part 1” link contains underscores instead of hyphens and the first link to courtnews is linked to a facebook redirect. Cheers and hope you are settling in nicely! Also this captcha is weird :S, lots of dots, guessing they’re numbers! …as for the captcha, someones designed a bot that can get around the image/text ones (and which posted 2000 spam comments in a few hours after launching the new version of my blog), so for now the number thing is my go-to.